Digital Uppercut has announced that Valfaris will release on Nintendo Switch – the next game from Steel Mantis, the developer behind Slain: Back From Hell. After it mysteriously vanished from galactic charts, the fortress of Valfaris has suddenly reappeared in the orbit of a dying sun. Once a self-contained paradise, the grandiose citadel now plays host to an ever-growing darkness. Therion, a fearless and proud son of Valfaris, returns to his home to uncover the truth of its doomed fate and to challenge the arcane evil at its very heart. 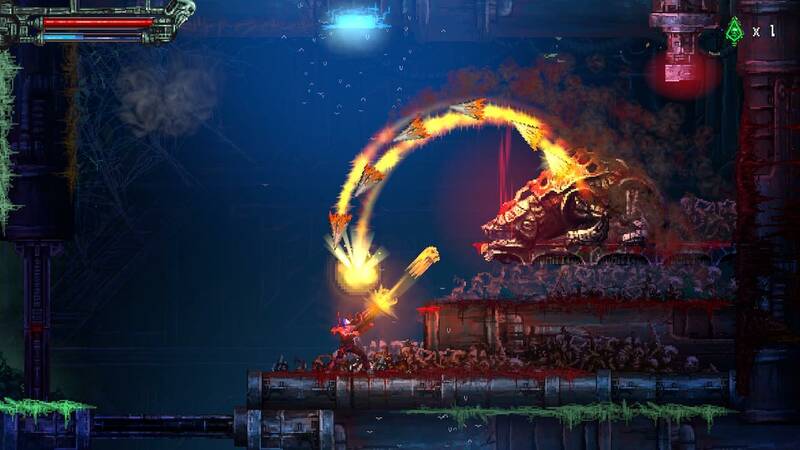 This heavy metal-infused 2D action-platformer will let you savagely reduce foes to piles of gibs with brutal weaponry, as you venture ever deeper into the dark world. It has been created with pixel art that Andrew Gilmour has handcrafted, and is set against a seismic soundtrack from former Celtic Frost guitarist, Curt Victor Bryant. Valfaris will release on the Nintendo eShop for Nintendo Switch worldwide in 2019.